We are a scottish /highland fold cattery based in France. We would need a logo to use in our page, for watermark and for marketing items. Actually we would need 2 designs. 1 minimalist design and a cartoon like design. 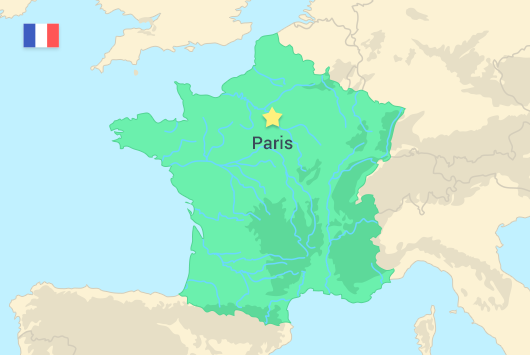 France is one of the largest countries in Europe with a territory of 248,573 square miles. It is a transcontinental country, with overseas territories in the Atlantic, Indian, and Pacific oceans, as well as French Guiana in South America. Its population is nearly 67 million people. Continental France has rich natural diversity that encompasses large mountain ranges, river valleys, and coasts on the Mediterranean Sea and the Atlantic Ocean. France is the second strongest economy in the European Union, and ranks ninth in the world. It is a member of the leading industrialized countries united in G7. A significant portion of the Fortune 500 companies are French. The country has a mixed economy with both private and state enterprises. It’s among the top world exporters of manufactured goods. The main exports include agricultural products and food—it is the third largest exporter of such products in the world. About 80% of people in France live in urban areas. There are a number of large metropolitan areas, including Paris with its 13 million citizens. The Lyon and Marseille areas are home to about two million people each, and Toulouse, Bordeaux, Lille, and Nantes house around one million. The population in rural areas mostly works in agriculture. Self-employment is popular in France. Recent legal reforms have made it easier for professionals to register micro-enterprises and operate as freelancers. Freelancing presents a number of benefits for young specialists who are looking for flexibility and interesting job opportunities. Top French professionals offer their services in software development, business management, design, communications, and IT. The official language in France is French. It was the international language of choice for three centuries before the popularization of English. The country has 77 minority languages, most of which are spoken in its overseas territories. The literacy rate in France is 99%. Since the 1200s, France has developed its strong tradition in higher education. Its oldest university is the University of Toulouse, which was founded in 1229. The country has hundreds of private and public universities and colleges today. Some of the most prestigious universities in the world are based there. The top French higher education institutions include the Ecole Normale Supérieure in Paris, Ecole Polytechnique (ParisTech), Université Pierre et Marie Curie (UPMC), and CentraleSupélec. French universities are a preferred choice for talented international students from around the globe. Many conduct their full education there, while others visit for a semester on the Erasmus program. Graduates from French institutions complete top degrees in technology, engineering, IT, business, marketing, and arts. The average monthly salary in France is 4,500 EUR (about $4,800). The lowest salaries are in the range of 1,200 EUR ($1,300). Customer service, media, and marketing and design specialists earn about 3,000 EUR ($3,200) per month. Banking, accounting and management salaries go as high as 5,000 to 7,000 EUR ($5,400–$7,500) per month. The common European Union currency, the Euro, is the currency of France as of 2002. The exchange rate is 1 USD to 0.944 EUR. Online payments from and to France are possible via transfer services like PayPal, Payoneer, and Transferwise, among others.